Conservation scientists say a lack of food is behind the drop in the UK population. A lack of food is behind a huge drop in the UK population of Arctic skuas, conservation scientists say. A study of 33 colonies in Orkney, Shetland and Handa, off Sutherland, recorded an 81% decline in breeding pairs from 1992 to 2015 - reduced from 1061 to 200. The seabird could become extinct as a breeding species in the UK if the trend is not reversed, the RSPB's Centre for Conservation Science has warned. Dr Allan Perkins, senior conservation scientist at RSPB Scotland and the study's lead author, said: "Lack of food has been the biggest pressure for these birds and shows just how vulnerable our seabirds and marine life are. "As sand eel numbers have declined around these key north east areas in Scotland the whole food chain is impacted. "If these sharp declines continue, it's possible that Arctic skuas will be lost as a breeding species in Scotland." Arctic skuas are medium sized seabirds with pointed falcon-like wings and long, pointed tail feathers. The colonies studied hold around a third of the UK's breeding population, all of which are found in Scotland. The total breeding population will be measured by the Seabirds Count census, a full survey of Britain and Ireland's seabirds during 2015-19. Peadar O'Connell, marine policy officer at RSPB Scotland, said: "This study provides a shocking snapshot of how Scotland's Arctic skuas are doing. "To protect Scottish seabirds, now and into the future, we need to ensure Scotland can provide safe places for them to breed, and secure protected areas for them at sea to feed. 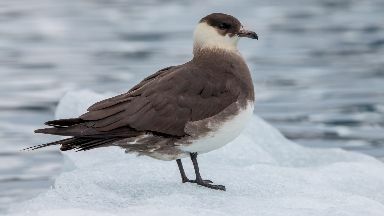 "One positive outcome would be for the Scottish Government to formally classify the 15 currently proposed Special Protection Areas for seabirds, including two sites for Arctic skuas."